Ireland continued their preparations for the forthcoming Rugby World Cup with a hard-earned victory over Scotland at the Aviva Stadium in Dublin. A tight first half was reflected in a 7-7 scoreline at the break, Chris Henry's opening try for Ireland being cancelled out by Blair Cowan's for Scotland. The lead changed hands on a regular basis in the second half, however, with Henry Pyrgos - skippering Scotland for the first time - and Peter Horne scoring for the visitors, but it was tries from Sean Cronin, Simon Zebo and Luke Fitzgerald that secured victory for Ireland. With the Aviva barely half full, there was a low-key atmosphere inside the ground and the early action on the pitch did little to raise the tension. Ian Madigan's scheming from fly-half was tidy enough for the Irish without looking penetrating, while Blake introduced himself to his new colleagues with a couple of brave drives. But the hosts remained patient and got their breakthrough after quarter of an hour. A line-out drive pushed the Scots back to their own try line but they could not deal with the power of the Irish pack and were undone when Chris Henry barged over from a yard out, with Madigan adding the extras. Gaining ground into Irish territory was a struggle for the Scots, even when they won their first scrum on opposition turf, the opportunity to advance was snuffed out by the dominant Irish forwards. But Vern Cotter's team refused to be deterred and finally broke into the home side's 22 after 32 minutes and dragged themselves level as Ruaridh Jackson - starting in an unfamiliar full-back slot - and Vernon combined to free-up Cowan in the corner. The New Zealand-born flanker's touchdown was consolidated as Horne squeezed over his kick from wide on the right touchline but he wasted the chance to nudge his team in front with a sloppy penalty attempt three minutes before the interval. Ireland had kicked four penalties into the corner during the first half and they were soon made to regret that decision-making four minutes after the restart when skipper Pyrgos put Scotland ahead. Jon Welsh burrowed his way to within a hair's breadth of the line, but, while the Irish backed off expecting Pyrgos to open the play, the Glasgow scrum-half caught them cold as he darted from the line. Scottish joy was tempered, though, as Horne again missed with his boot, while Ryan Grant had to be taken off on a stretcher with an ankle knock, leaving his World Cup hopes in major doubt. Ireland hit back when Madigan stuck another free-kick into touch. This time the ploy worked as Cronin muscled his way over from a successful line-out drive. Madigan put his side momentarily in front with a conversion, but a Horne penalty once again handed Scotland the initiative. With 20 minutes remaining Ireland thought they had finally killed off their rivals when Isaac Boss and Madigan worked a clever combination before sending Zebo galloping in behind the Scottish defence to score under the posts. Madigan did the necessary with the conversion but when Scotland's veteran wing Sean Lamont was allowed to power his way forward and offload to Horne soon after, there was nothing Ireland could do as the centre ran in Scotland's third touchdown, converted this time by Jackson. However, the crazy encounter continued to excite and Ireland did eventually put themselves out of sight with 10 minutes left as Madigan's cross-field kick landed perfectly in Fitzgerald's grasp before the winger skipped past Jackson to score. Madigan again added the conversion but could have eased his side's nerves had he not wasted a penalty chance with five minutes left. 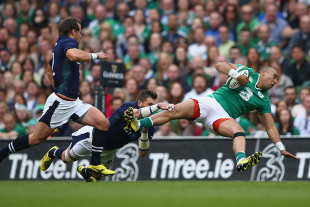 A last-gasp bid from the visitors was fumbled by Blake, though, and Ireland clinched the win.